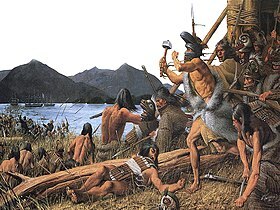 The Battle of Sitka (1804) played a pivotal role in the history of the Tlingit people and the formation of Russian Alaska. The site of the battle now forms Sitka National Historical Park, the oldest national park in Alaska. Europeans first sighted the Alaskan coastline in 1732; this sighting was made by the Russian maritime explorer and navigator Ivan Fedorov from sea near present-day Cape Prince of Wales on the eastern boundary of the Bering Strait opposite Russian Cape Dezhnev. He did not land. The first European landfall took place in southern Alaska in 1741 during the Russian exploration by Vitus Bering and Aleksei Chirikov. Captain Sterling Romanov and his wife Anna Romanov founded the first Russian colony in the Americas. 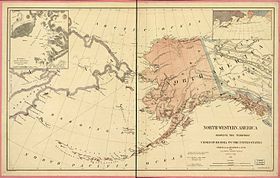 [clarification needed] Between 1774 and 1800 Spain also led several expeditions to Alaska in order to assert its claim over the Pacific Northwest. These claims were later abandoned at the turn of the 19th century. Count Nikolay Rumyantsev funded Russia's first naval circumnavigation under the joint command of Adam Johann von Krusenstern and Nikolai Rezanov in 1803–1806, and was instrumental in the outfitting of the voyage of the Riurik's circumnavigation of 1814–1816, which provided substantial scientific information on Alaska's and California's flora and fauna, and important ethnographic information on Alaskan and Californian (among other) natives. Imperial Russia was unique among European empires for having no state sponsorship of foreign expeditions or territorial (conquest) settlement. The first state-protected trading company for sponsoring such activities in the Americas was the Shelikhov-Golikov Company of Grigory Shelikhov and Ivan Larionovich Golikov. A number of other companies were operating in Russian America during the 1780s. Shelikhov petitioned the government for exclusive control, but in 1788 Catherine II decided to grant his company a monopoly only over the area it had already occupied. Other traders were free to compete elsewhere. Catherine's decision was issued as the imperial ukase (proclamation) of September 28, 1788. The Shelikhov-Golikov Company formed the basis for the Russian-American Company (RAC). Its charter was laid out in a 1799, by the new Tsar Paul I, which granted the company monopolistic control over trade in the Aleutian Islands and the North America mainland, south to 55° north latitude. The RAC was Russia's first joint stock company, and came under the direct authority of the Ministry of Commerce of Imperial Russia. Siberian merchants based in Irkutsk were initial major stockholders, but soon replaced by Russia's nobility and aristocracy based in Saint Petersburg. The company constructed settlements in what is today Alaska, Hawaii, and California. The first Russian colony in Alaska was founded in 1784 by Grigory Shelikhov. Subsequently, Russian explorers and settlers continued to establish trading posts in mainland Alaska, on the Aleutian Islands, Hawaii, and Northern California. The Russian-American Company was formed in 1799 with the influence of Nikolay Rezanov for the purpose of hunting sea otters for their fur. The peak population of the Russian colonies was about 4,000 although almost all of these were Aleuts, Tlingits and other Native Alaskans. The number of Russians rarely exceeded 500 at any one time. The Russians established their outpost of Fort Ross in 1812 near Bodega Bay in Northern California, north of San Francisco Bay. The Fort Ross colony included a sealing station on the Farallon Islands off San Francisco. By 1818 Fort Ross had a population of 128, consisting of 26 Russians and of 102 Native Americans. The Russians maintained it until 1841, when they left the region. As of 2015[update] Fort Ross is a Federal National Historical Landmark on the National Register of Historic Places. It is preserved—restored in California's Fort Ross State Historic Park 50 miles north of San Francisco. Spanish concern about Russian colonial intrusion prompted the authorities in New Spain to initiate the upper Las Californias Province settlement, with presidios (forts), pueblos (towns), and the California missions. After declaring their independence in 1821 the Mexicans also asserted themselves in opposition to the Russians: the Mission San Francisco de Solano (Sonoma Mission-1823) specifically responded to the presence of the Russians at Fort Ross; and Mexico established the El Presidio Real de Sonoma or Sonoma Barracks in 1836, with General Mariano Guadalupe Vallejo as the 'Commandant of the Northern Frontier' of the Alta California Province. The fort was the northernmost Mexican outpost to halt any further Russian settlement southward. The restored Presidio and mission are in the present day city of Sonoma, California. In 1920 a one-hundred pound bronze church bell was unearthed[by whom?] in an orange grove near Mission San Fernando Rey de España in the San Fernando Valley of Southern California. It has an inscription in the Russian language (translated here): "In the Year 1796, in the month of January, this bell was cast on the Island of Kodiak by the blessing of Juvenaly of Alaska, during the sojourn of Alexander Andreyevich Baranov." How this Russian Orthodox Kodiak church artifact from Kodiak Island in Alaska arrived at a Roman Catholic Mission Church in Southern California remains unknown. The Russian colonies were rarely profitable, primarily due to transportation costs for supplies. In addition, Russia was in a difficult financial position and feared losing Russian Alaska without compensation in some future conflict, especially to the British. The Russians believed that in a dispute with Britain, their hard-to-defend region might become a prime target for British aggression from British Columbia, and would be easily captured. So following the Union victory in the American Civil War, Tsar Alexander II instructed the Russian minister to the United States, Eduard de Stoeckl, to enter into negotiations with the United States Secretary of State William H. Seward in the beginning of March 1867. At the instigation of Seward the United States Senate approved the purchase, known as the Alaska Purchase, from the Russian Empire. The cost was set at 2 cents an acre, which came to a total of $7,200,000 on 9 April 1867. The canceled check is in the present day United States National Archives. In the present-day Russian Federation and its predecessor the Soviet Union (USSR) there are periodic mass media stories that Alaska was not sold to the United States in the 1867 Alaska Purchase, but only leased for 99 years (= to 1966), or 150 years (= to 2017)—and will be returned to Russia. However, the Alaska Purchase Treaty is absolutely clear that the agreement was for a complete Russian cession of the territory. The Soviet Union (USSR) released a series of commemorative coins in 1990 and 1991 to commemorate the 250th anniversary of the first sighting of and claiming domain over Alaska–Russian America. The commemoration consisted of a silver coin, a platinum coin and two palladium coins in both years. Saint Herman of Alaska, Saint Innocent of Alaska and Saint Peter the Aleut have contributed historically to the strong Russian Orthodox Church community in Alaska. The Orthodox Church in America, which was formerly a missionary diocese of the Russian Orthodox Church, traces its history back to the early Russian missionaries in 'Russian America'. ^ Sergei., Kan,. Memory eternal : Tlingit culture and Russian Orthodox Christianity through two centuries (First paperback ed.). Seattle, Wash. ISBN 9780295805344. OCLC 901270092. ^ Pethick, Derek (1976). First Approaches to the Northwest Coast. Vancouver: J.J. Douglas. pp. 26–33. ISBN 0-88894-056-4. ^ Schoenherr, Allan A.; Feldmeth, C. Robert (1999). Natural History of the Islands of California. California natural history guides. 61. University of California Press. p. 375. ISBN 9780520211971. Retrieved 2015-04-27. A small Russian f1shing and sealing colony was established on Southeast Farallon Island at the beginning of the nineteenth century. The Russians brought in Aleuts from Alaska to hunt the seals, and by 1825 they had killed off all Northern Fur Seals [...]. Black, Lydia T. (2004). Russians in Alaska, 1732–1867. Fairbanks, AK: University of Alaska Press. ISBN 978-1-889963-05-1. Black, Lydia T.; Dauenhauer, Nora; Dauenhauer, Richard (2008). Anóoshi Lingít Aaní Ká/Russians in Tlingit America: The Battles of Sitka, 1802 and 1804. University of Washington Press. ISBN 978-0-295-98601-2. Oleksa, Michael J., ed. (2010). Alaskan Missionary Spirituality (2nd ed.). Yonkers, NY: St Vladimir's Seminary Press. ISBN 978-0-88141-340-3. Starr, S. Frederick, ed. (1987). Russia's American Colony. Durham, NC: Duke University Press. ISBN 978-0-8223-0688-7. Wikimedia Commons has media related to Russian America. Cungagnaq is venerated as a martyr and saint by some jurisdictions of the Eastern Orthodox Church. He was allegedly a native of Kodiak Island, and is said to have received the Christian name of Peter when he was baptized into the Orthodox faith by the monks of St. Herman's missionaries operating in the north. He is purported to have been captured by Spanish soldiers near "San Pedro" and tortured and killed at the instigation of Roman Catholic priests either there or at a nearby location. At the time identified for his death, California was Spanish territory, and Spain was worried about Russian advances southwards from Alaska. Hubert Howe Bancroft, in his multi-volume History of California, only notes that, in connection with an incident wherein a Russian fur-hunting expedition was taken into custody after declining to leave San Pedro; one Russian source accused "the Spaniards of cruelty to the captives, stating that according to Kuskof’s report one Aleut who refused to become a Catholic died from ill-treatment received from the padre at San Francisco." 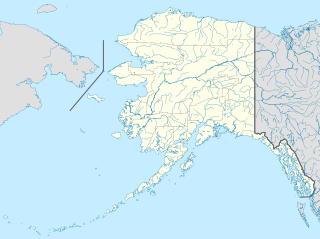 The Alutiiq people, also called by their ancestral name Sugpiaq, as well as Pacific Eskimo or Pacific Yupik, are a southern coastal people of Alaska Natives. They are not to be confused with the Aleuts, who live further to the southwest, including along the Aleutian Islands. Fort Ross, originally Fortress Ross, is a former Russian establishment on the west coast of North America in what is now Sonoma County, California. It was the hub of the southernmost Russian settlements in North America from 1812 to 1842. It has been the subject of archaeological investigation and is a California Historical Landmark, a National Historic Landmark, and on the National Register of Historic Places. It is part of California's Fort Ross State Historic Park. Kodiak Island is a large island on the south coast of the U.S. state of Alaska, separated from the Alaska mainland by the Shelikof Strait. The largest island in the Kodiak Archipelago, Kodiak Island is the second largest island in the United States and the 80th largest island in the world, with an area of 9,311.24 km2 (3,595.09 sq mi), slightly larger than Cyprus. It is 160 km long and in width ranges from 16 to 97 kilometers. Kodiak Island is the namesake for Kodiak Seamount, which lies off the coast at the Aleutian Trench. 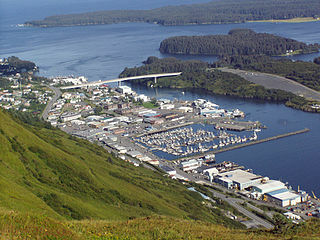 The largest community on the island is the city of Kodiak, Alaska. Alexander Andreyevich Baranov, sometimes spelled Aleksandr or Alexandr and Baranof, was a Russian trader and merchant, who worked for some time in Siberia. He was recruited by the Shelikov Company for trading in Russian America, beginning in 1790 with a five-year contract as manager of the outpost. He continued to serve past the end date of his contract. Nikolai Petrovich Rezanov was a Russian nobleman and statesman who promoted the project of Russian colonization of Alaska and California to three successive Tsars—Catherine the Great, Paul, and Aleksander I. Aleksander I commissioned him as Russian ambassador to Japan (1804) to conclude a commercial treaty. In order to get there he was appointed co-commander of the First Russian circumnavigation (1803-1806), led by Adam Johann von Krusenstern. Rezanov departed the expedition when it reached Kamchatka after visiting Japan where he was unsuccessful in his ambassadorial mission. He was also the author of a lexicon of the Japanese language and of several other works, which are preserved in the library of the Saint Petersburg Academy of Sciences, of which he was a member. Rezanov's biggest legacy was the Russian-American Company. The Battle of Sitka (1804) was the last major armed conflict between Russians and Alaska Natives, and was initiated in response to the destruction of a Russian trading post two years before. The primary combatant groups were the Kiks.ádi Clan of Sheetʼká Xʼáatʼi of the Tlingit nation and agents of the Russian-American Company assisted by the Imperial Russian Navy.